In my last post on March 20, I wrote about a large birchbark canoe, and described how we removed it from the Fur Trade exhibit area of the Canada Hall. This post will discuss the thought process and effort required to move a late-1930s three-quarter-ton Dodge Fargo pickup truck. Early in our planning sessions, we identified the most logical and direct route out of the exhibition area to the freight elevator. It wasn’t the same as the one provided by the twisting visitor route. We decided on a direct path through display areas, which meant that we had to identify specific exhibits we would need to remove to provide direct access. We dismantled the exhibits working backwards from the freight elevator to the opposite end of the Hall. Once the team had completed the artifact removal from these spaces, we could dismantle exhibit structures to open up our route and allow for large artifact movement. This had the added benefit of also providing a more direct and efficient route for staff working in the Hall. 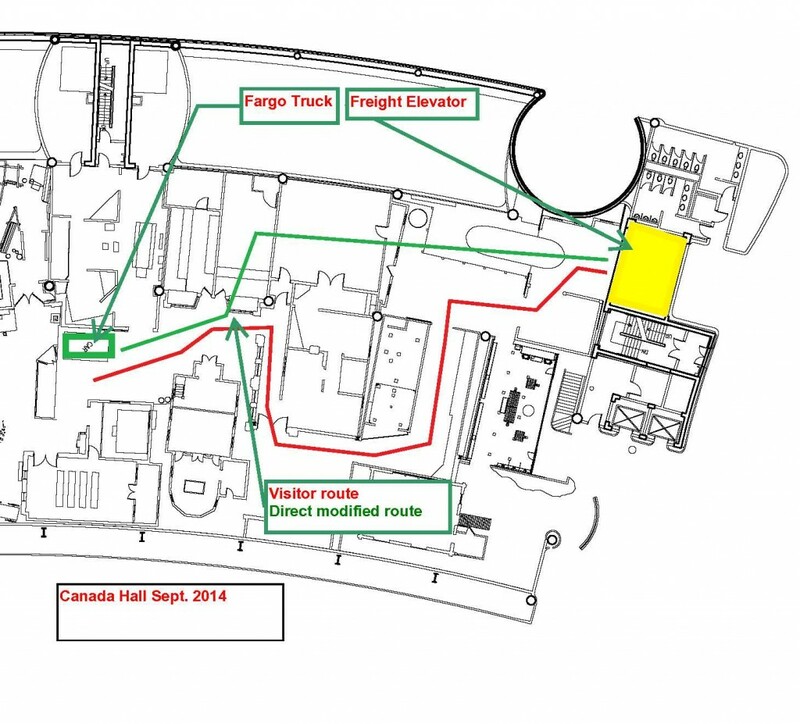 This floor plan shows the modified route we prepared to facilitate the removal of large artifacts from the Canada Hall. 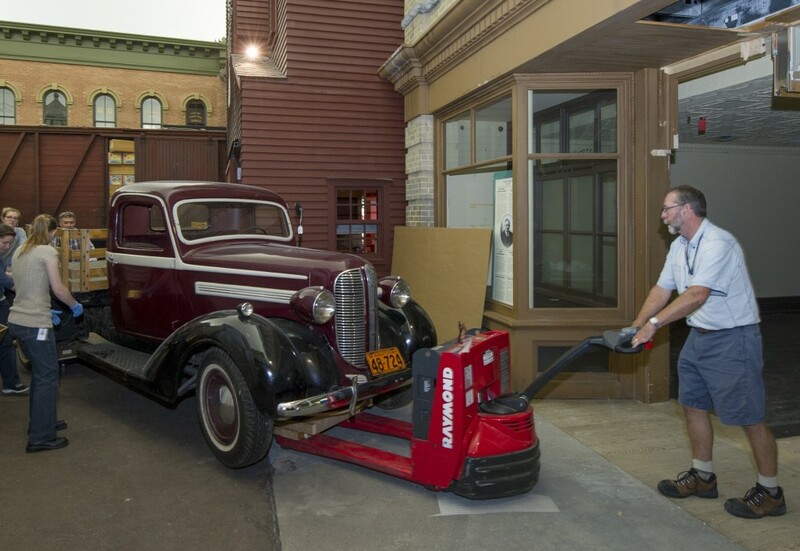 The Dodge was located outside the Railway Station and Grain Elevator exhibits, about midpoint in the Canada Hall. It was positioned tight against the Grain Elevator, but that posed no real problem. The uneven floor and very tight corners that had to be negotiated, however, were an issue. The floors made it problematic for staff to push the truck using our small wheeled dollies; but, to use our larger dollies, we would have had to lift the entire truck much higher to position the dollies under the axles. Although that would have made the vehicle easier to push, a heavy object with a much higher centre of gravity on an uneven surface was a situation we wanted to avoid. Photograph of the turntable constructed to remove the Dodge Fargo from the Canada Hall. Canadian Museum of History, photo: Steven Darby. There was an alternative. We have a motorized pallet lifter capable of raising and travelling with up to 2200 kilograms. That provided more than enough lift, as well as measured controllable motive power; on its own, however, the lifter lacked the agility we needed to make the tight corners. We needed to allow the lifter to pivot while lifting and pulling the Dodge. After some thought, I determined that the solution was to build a turntable. 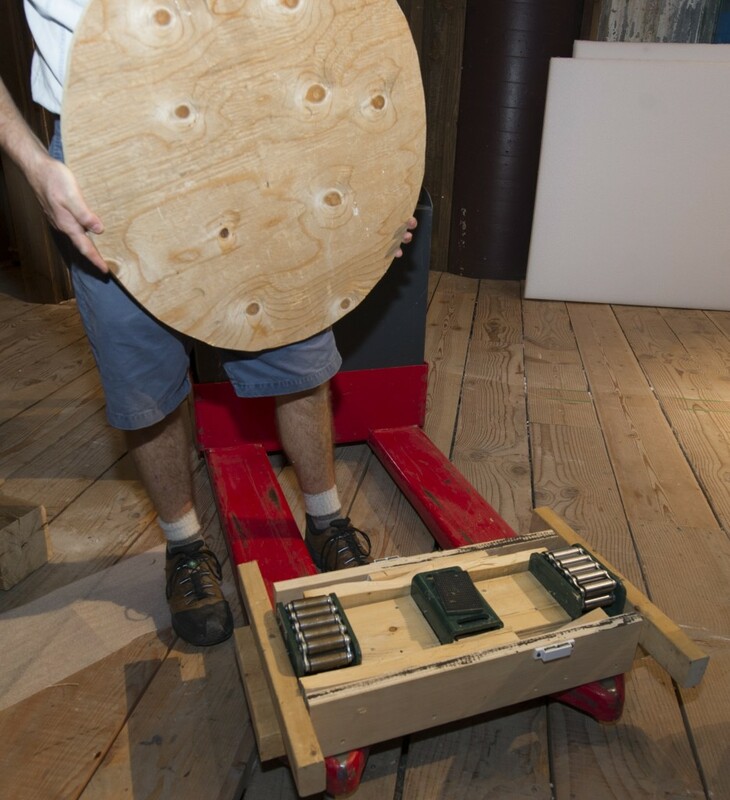 I constructed a device using materials and equipment we had on hand: three Hillman rollers in a frame, topped with a ¾-inch plywood disk. 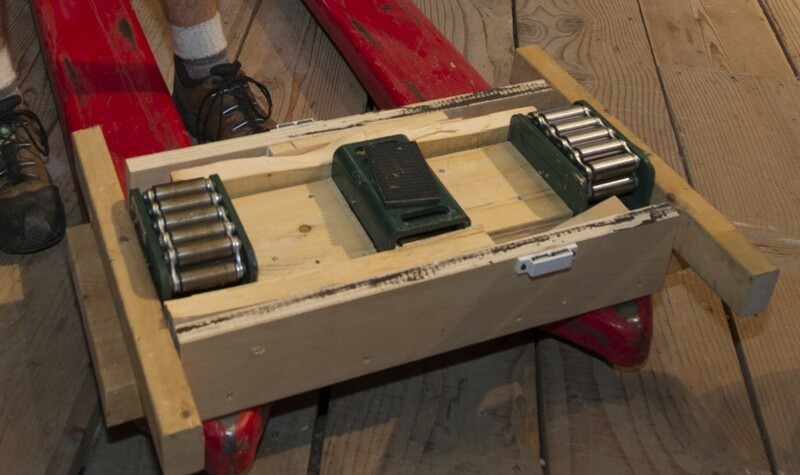 As you can see in the images above, the outside rollers were placed upside-down. This allowed the plywood disk to pivot on a fixed central roller as we turned corners. Placing the turntable on the pallet lifter beneath the front axle, and placing the rear axle on dollies, allowed the unit to pivot freely enough to travel through the openings we’d created to the freight elevator. This system also allowed us to keep the truck’s front tires as close to the floor as possible, keeping its centre of gravity low and risk to a minimum. 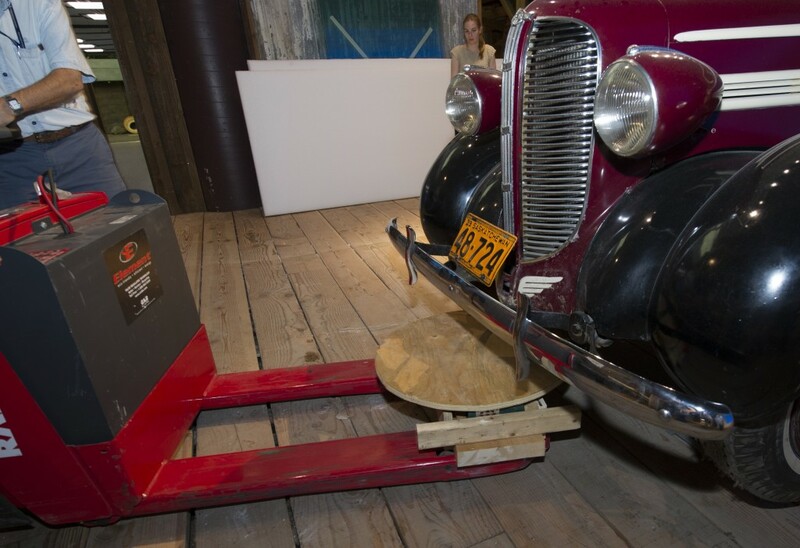 Photograph of the Dodge Fargo pickup truck on the turntable. Canadian Museum of History, Photo: Steven Darby. With Collections and Preparation staff guiding the rear end of the truck, I was able to manoeuvre it through the openings to the freight elevator and eventually to one of our larger Collections rooms. 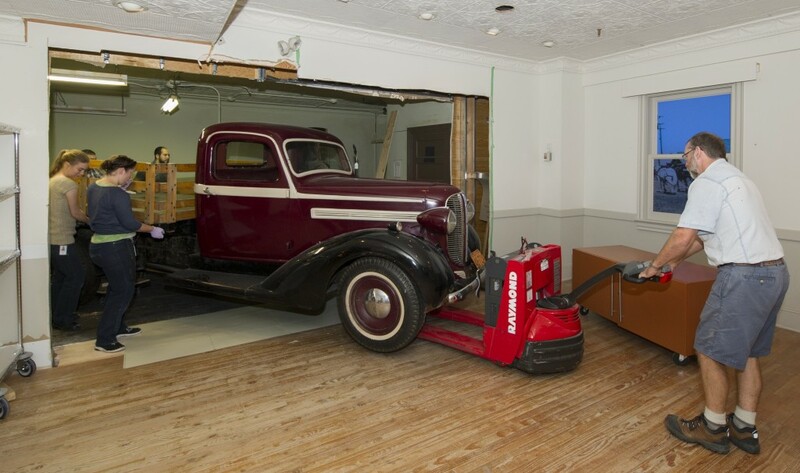 Collections specialists moving the Dodge Fargo pickup truck out of the Canada Hall using the modified route. Canadian Museum of History, Photo: Steven Darby. While completing this post, it occurs to me that both the canoe and the truck are transportation-related artifacts, and that a number of possible topics for future discussion (in my very very flexible plans for future blogging) are also transport-themed. The movement of people and goods quite obviously played a major role in the history and development of our country. It goes without saying, of course, that all of the efforts above required a team of dedicated professionals. They know who they are so I’ll use first names only and give my thanks in no particular order to Erin, Tinisha, Wojtek, Dave, Joe, Jennifer, Mona and Derick. As I mentioned in my previous post, I am happy to provide whatever answers I can to any questions or comments you may have about this process.